Among them were dozens of former journalists who had been ejected from their jobs due to their roles in promoting freedom of the press and democracy. Their long-cherished dream of beginning an independent newspaper came true through successful fundraising, which began shortly after popular uprising against the military dictatorship in 1987. The Hankyoreh was inaugurated on May 15, 1988. The Hankyoreh is a progressive newspaper, decisively committed to journalistic freedom, democracy, peaceful coexistence and national reconciliation between South and North Korea, which were divided by external forces after World War II. 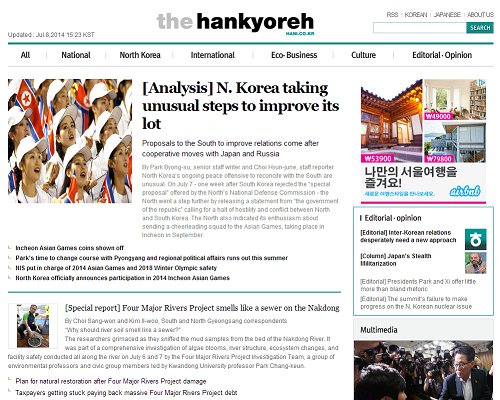 The Hankyoreh is unrelenting but fair in coverage. It does not negate the philosophy of the free market economy, individual liberty and personal freedom. But it accepts that the more detrimental effects of an unbridled market economy should be regulated by various means. Its distinct feature is its unique ownership. Unlike most traditional Korean newspapers, under the ownership of a family or business conglomerate, the Hankyoreh is owned by about 62,000 shareholders who joined the original drive for the paper's inception. They are from all walks of life in Korea, ranging from teachers to university students to housewives. Even though their backgrounds are different, they have one value in common: a desire for a genuinely independent newspaper and for full-fledged democracy in Korea.